We live in uncertain times. It is not possible to see a clear outcome, but it is extremely interesting to reach for some archetypes, distinct and possible outcomes against which we can set our plans. This text is not subject to copyright and you are welcome to circulate it if you find it helpful. Please note that it was published in Feb 2009. The origins of the downturn have been endlessly rehearsed. In exceptional prcis, the crisis has stemmed from a set of short- and long run factors, which it is convenient to treat separately. Four chief factors contributed to the long-run drivers of the crisis: first, the opening up of, in particular China and its vast pool of savings hungry for a safe haven, its cheap labour and its appetite for raw materials. A general flood of Asian savings developed after 2004, making US companies and individuals the global 'borrower of last resort'. Second, immense stimulus to borrow was generated by historically low real interest rates in the US. From 2001 the US Federal Reserve kept interest rates extremely too low as a bulwark against deflation, seen as a likely outcome of the dot.com collapse. The rising tide of cheap goods from China and other emerging markets held down the consequent potential inflation by cutting supply costs, and whilst there were complaints about job losses, lowered costs meant that there net jobs were generated. Falling commodity prices through much of the 1990s had a similar affect. Third, cheap money and emerging market wealth that was seeking a safe haven drove up asset prices. It was easy to borrow and buy assets such as shares or property at rates which were less than asset price inflation. The US and UK middle classes in particular grasped the notion of something for nothing with enthusiasm, and geared themselves as never before. Bubbles dominated capital markets in the late 1990s Asia, Internet, Asia again, the current complex mess and the debt of corporations and individuals rose to unprecedented levels against both earnings an assets. The shorter term drivers have also been much rehearsed. The middle class bubble was extended to the less well off as a matter of 'inclusive' social policy by the Clinton government, subsequently extended by Bush. Specifically, incentives were offered to poor Americans to acquire property, and a host of more or less scrupulous intermediaries raced to mine this seam of gold. 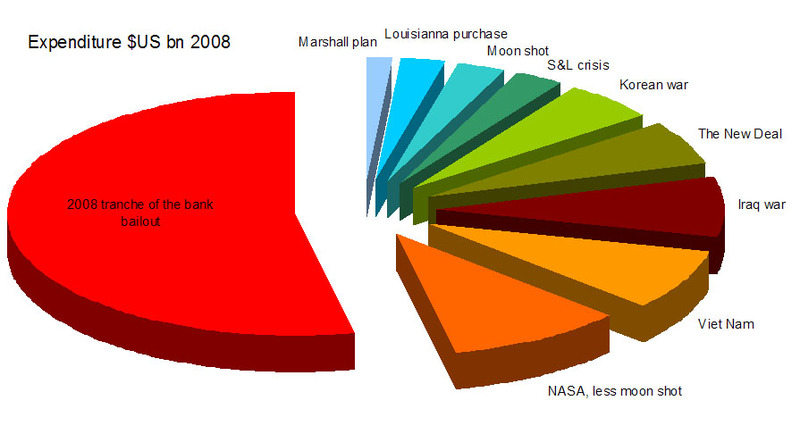 Mis-lending occurred at a geophysical scale, with people acquiring debt that they could never hope to pay off. Entwined with this, banks found that they could generate significant sums by churning the assets which they held for large institutions. For example, turning over a portfolio once a year for a 1% fee would 'fine' a pension fund about a third of its entire yield over a 25 year period. Studies suggest that the financial services industry extracted about US$1.2 trn from the assets which it held in this way in the period 1995-2005. Such churning was, however, held to be inseparable from the generation of high yields on these deposits. Insurance companies and others with high liquidity were also subject to these measures. Additionally, cheap capital and the other dynamics already mentioned caused banks to gear themselves for 'own account' trading at an unprecedented scale. The growth of novel institutions, such as hedge funds, followed the same patterns. Sums several times in excess of gross world product were being traded in zero sum games as the crisis began to mature. A further complication was the obfuscation of assets through a series of increasingly obscure instruments. These purported and indeed did separate assets into baskets with more or less risk attached to them. Those with an appetite for risk could hold the high yield parts of the package, whilst those with more traditional interests could re-badge the now supposedly safer assets as risk free, and raise yet more capital against them. Three complications arose. First, the utter opacity of the instruments meant that many aspects of accounting failed, and the back offices of the banks, regulators, senior staff and external accountants were still and are still, 18 months after the problem became apparent unable to say what a given asset is worth. Mark-to-market accounting is appropriate as a fire-sale measure, but nobody knows what the market value of an obscure and possibly poisonous asset may be. Accountancy functioned adequately with less obscure instruments, but was rendered hopelessly inadequate when the underlying asset ranking system itself failed. Risk was mis-measured. Investors, banks and regulators had outsourced the measurement of risk to the ratings agencies and failures on their part have been particularly malign. They proved to be both ill-equipped to do the job and far from independent of those whom they were supposed to view objectively. Their fees were paid by those issuing a security, and there was competition between the agencies for this business. Moody's Investors Service, Standard & Poor's and Fitch Ratings all now face substantial law suits. Whatever the pressures on the agencies, poor risk assessment stemmed chiefly from unchallenged assumptions: for example, assets were rated AAA on the basis that US house prices never went down. If house prices could fall, then the ratings were innately wrong. Prices did fall. Had the assets been closer to what was traditionally meant by AAA, then it is probable that the owners could have handled the risk and the crisis would not have taken its present form. Second, the mis-selling of property meant that many loans that appeared to be sound were not. (Many commercial and overseas loans appear to be of a similar nature.) Third, the scheme for parcelling out risk worked only if those accepting the risk had the assets to cover it if things went wrong. They did not, and the structure was thereby invalidated. The consequence of this managerial incompetence is that many large banks are insolvent, are propped up by government or do not know if they are solvent or not. None will lend to the others. Nobody believes anything an accountant says, and lawyers are sharpening their pencils. Intervention and the search for solutions. The state caused much of the crisis, though poor regulation, the desire of politicians to keep the wheels turning on their watch and central banks monomania about general, rather than focused, inflation. The state has, by and large, now accepted a major role in carrying the consequent burden. The sums are titanic, and the consequences may or may not be those intended. The Chairman of the US Federal Reserve, Mr Bernanke, is on record as saying that 'first you put out the fire, then you worry about reconstruction'. It remains to be seen whether the fire is put out, and if so which particular fire it is. There are, of course, several distinct fires that are burning, and it is arguable that there is a warehouse full of inflammables close to hand, in the shape of prospective inflation. The insolvency of so many major banks, and the drying up of the stream of credit for which they were the conduit is, of course, one such fire. The precipitation into crisis of many individuals and firms that had become over-extended is another. A third blaze is the slowdown of the economy, chiefly in advance of and in anticipation of both of these issues. States have variously addressed all three of these with quite different emphasis. A table may help to sort all of this out. As can be seen, most of the measures that have been taken so far are designed to help banks, presumably in the belief that this is primarily a banking crisis, or that bank failure was the largest fire. Something around US$10.5 trillion has been allocated to this worldwide. Banks are thought to have destroyed about US$1.4trn, with around US$4 trillion still at risk. The situation certainly contains a major banking crisis but - and this cannot be over-emphasised - is far from limited to it. The broader issue that of widespread, wildly overextended debt is directly addressed only by two short term measures, reducing interest rates and taxes. However, a very large 'however', it can also be mitigated by inflation, to which we turn in a moment. Plainly, such a course can be followed on purpose or by mistake. Either way, it is a very painful solution. The immediate economic slow-down is affected by these policy levers in its own particular ways. There are two distinct things going on. The current recession is consequent on the anticipation of trouble, rather than its arrival. The slow-down that is in prospect for 2009/10 is, however, expected to result from reduced consumer spending and commercial investment, perhaps due to the banking crisis, certainly due to unemployment, slowed wage growth, lowered profits and so forth. The uncertainty is vested in the strength with which the banking crisis, and the measures taken to manage this, impact on what commentators like to call the "real economy". The direct connection between general economic activity and the banking crisis is not entirely clear. The key linkage occurs through the purchasing behaviour of the highly indebted and the limits to the ambitions of those who want to run up more debt. Companies which cannot live within their cash flow are affected, particularly those which are cash negative because they are investing to grow. There is a general tendency to squeeze cash out of assets rather than to invest to create new ones. Banks have called in some loans and delayed others to increase their liquidity, but the affect of this is thought to be relatively minor. Demand for cars has fallen, for example, because fleet buyers stopped purchasing in 2007. Private buyers can still get credit from companies: Ford and many others offer several years of funding at no charge. If people do not buy, this is because they are uncertain about the future and feel they have too much debt, not necessarily because a bank will not lend to them. How they will behave depends on how they will feel, given the resolution of the above uncertainties. Consequently, we have two separate things happening at the same moment. The asset bubble and the debt to which it gave buoyancy had to come to an end. It might have done so in a gradual manner, but it was precipitated by the banking crisis. The banking issue is a very large sideshow to this, but in the long term - a secondary issue nonetheless. In the short term, however, it is centre stage and there is no question that state intervention prevented the collapse of many banks and the destruction of many people's savings. So much has been committed to this, and the banks are so overburdened as a result of their misadministration and rescue, that they will be walking wounded for a considerable period. The stock market of Japan was capitalised at 43% of the entire world before it collapsed in 1987. One small park in Tokyo was valued at more than all the property in Manhattan. Many banks, which were then amongst the world's largest companies, were rendered insolvent when this bubble collapsed. The Japanese government, and the closely interlocked zaibatsu, refused to address this issue directly, preferring to keep the wounded walking, or at least weakly waving as they drowned by inches. The result has been 20 years of stasis, during which the former super-power has declined into something like old age. It is important that the OECD economies avoid this trap, and that they let nature, its predators and harsh remedies settle matters. Most of all, it is important that the foreground issue of the banking crisis is not allowed to draw us into a much deeper crisis. The deep crisis is, of course, a return to inflation. Supply inflation was pressing us nine months ago: food, fuels and minerals had all attained record prices. Indeed, this fact further fuelled the asset bubble, or capital inflation as it should be better known. Monetary inflation had, however, been banished by central bank control of the money supply and political probity around this. Such probity has been abandoned, with states spending far more than their income and running up colossal debt that future generations will have to repay. This time frame is already burdened by unfunded state pensions and welfare commitments, with a marked demographic transition in much of the industrial world and by unfavourable changes in the grounds for international competition. In addition, however, respectable people are talking openly about seinorage, about printing money that they have no intention of removing from circulation. These are unattractive numbers, but they are not the stuff of doom. Markets have, of course, dumped equities and the extent to which they have done so assumes much worse outcomes. Most commentators expect a rapid regain of equity values, particularly if the supply chains so carefully pared to the bone during the last nine months are suddenly shocked by demand. We could then see an equity bubble as early as the third quarter of 2009. Bond markets appear to assume that inflation will not reappear. There is, however, every reason to believe that inflation will be brought about, and there are special reasons why bonds are being bought by institutions, link to risk aversion and cheap capital. However, there are times when inflation is the state's friend, if not that of the consumer or the saver. Those times are when many voters are in debt, when the voting behaviour of savers is virtually predetermined by party and when the state holds major liabilities. A burst of inflation would solve many problems. It would shrink consumer debt, reduce state liabilities and allow the indebted companies to which states are chained to put their problems behind them. The cost would be reduced investment, reduced confidence, a weakened currency and reduced saving. These may be prices which some governments may pay, and which other states or aggregates such as the EU could not afford not to follow. This is a complex situation, but it can be simplified to two dimensions. The first of these is whether the strict banking crisis is resolved rapidly or whether it drags on, with continued state support. We do not know the answer to this. The second dimension asks whether the general economic situation is completely dominated by the banking crisis of the moment, or is somewhat independent of it. This generates the four quadrants that are shown above. If the economics is predicated on the banks alone that is, that consumer debt and negative equity are unfortunately but tractable features of the economic landscape then we revert to business as usual. If the dependency of the economy on the banks remains true, but state intervention and internal change push us into a situation such as was occupied by Japan since 1987, then we will find ourselves in an increasingly statist world, in which governments lurch from one fix to another, one dirigiste measure to the next. Support for the saver and consumer will wane in favour of tax raising and other measures to patch state finances. If the banking crisis proves to be relatively decoupled from the economy as a whole as was the case with the dot.com collapse in 2002, when the market fell roughly as far then we are in a different environment. The precautions taken in 2007-08 will prove unfounded and there will be a capacity crisis. At the same time, the state-generated flood of money and cheap credit will trigger demand-led inflation. Shares will rebound and bonds will tank; state income will rise but continued indebtedness, uncertainty about the revival and inflation will make deflationary tax raising difficult. New and different ways of fulfilling the role of the banker will quickly develop and the dinosaurs will be allowed to die. If the banks survive and, additionally, the economy recovers, then the temptation to take robust measures will be ever-present. Above, we have seen the attractions of a burst of inflation for states with more than average consumer and state debt. This is the far-from-preordained potential of the quadrant in the lower left of the figure. Reality will be a blend of all of the above and much more besides, as we all know. The outcome will vary from state to state, with the US having its particular issues, Europe facing a quite different kind of stagnation and the emergent economies as different from each other as bricks and butter. There is one area is which further analysis may be helpful. Above, we took it as read that we did not know whether the economy as a whole was utterly, strongly or somewhat attached to the fate of the banking sector. However, we may be able to reduce this uncertainty somewhat. There is a much repeated mantra that 'banking really is different' and, plainly, it has some truth. 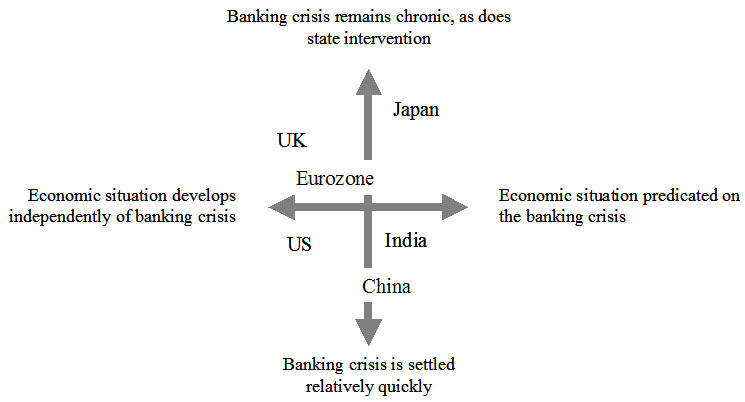 Capital is one of a limited number of crucial factors without which economies cannot function. (Others include labour and skill, ingenuity and technical capability, the rule of law and the general tranquillity of the operating environment.) Savings do, however, need to be connected to potential users of that capital. If banking is to be of much lessened importance, some means has to be found of connecting these partners in a transaction which is guaranteed by something in the order of the state. Large entities of this sort exist only as banks. That said, we may see a rapid disassociation of the 'soup to nuts' bank into more specialised, granular functions, operating within a highly transparent and tightly regulated environment. Plans are afoot to reconstruct banking in ways which shed its Nineteenth and Twentieth century origins. Such a structure would be built around networks and information flows. It would almost certainly be much less profitable than traditional banking, and many parts of it would not see themselves as anything to do with banking. The exact nature of such a structure is, to say the least, schematic; but it is clear that many authorities are working collectively and separately to reconstruct this entire industry in a less accident prone form. This said, one needs to take a position on where all this might go. My own view places 2010 to the left, if not the extreme left of the figure, and somewhere close to the vertical centre. I have marked the likely situation of the major players. Readers are invited to play spot the ball for themselves, and a blank figure is appended for this purpose. Here is a blank figure, on which you may wish to plot your own views. You may wish to speculate what happens to the continued flood of Asian savings if the traditional markets are unable to accept them, or if they remain unacceptably risky. Will Asians save less, consume more or sit on gold bars? Or may they begin to buy raw material assets, following a trend set by many sovereign wealth funds? Might we see a speculative minerals boom? The tiger economies of Asia have taken a major battering in the past year, reporting contractions of anything up to a quarter of nominal GDP. Their banks are, however, relatively unaffected by the G7 crisis, their people have limited personal debt and high levels of saving. The contraction has occurred for two reasons: reduced exports and - the local concomitant of this - profound de-stocking in the supply chain. In other words, the affects that are felt now were generated before the 'credit crunch' could have crunched, and that what we see is classical cyclical behaviour, where anticipation over-amplifies otherwise appropriate behaviour. 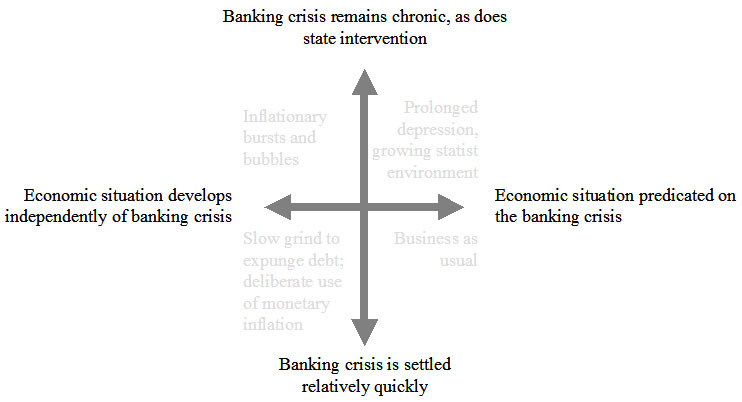 It remains to be seen to what degree the banking crisis, the debt 'chronic' and the conventional slowdown interact organically, and to what extent it is possible to recover from one without necessarily having mended the others. As we have noted above, however, this is central to any rational view of where all of this is going. We close with a figure that we have re-drawn from secondary sources, which shows the scale of the first tranche of US bank rescues, set against other well-known US expenditure. We do not confuse a guarantee with money spent - or not yet, anyway - but the scale of the actions, mostly taken in haste, are truly extraordinary.